Nitrogen is a key nutrient for microbes, plants, and animals that undergoes many transformations in the soil. 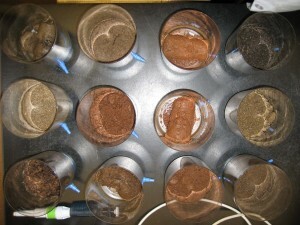 Our research aims to quantify rates of soil nitrogen cycling and elucidate the controls on those rates. We have used 15N tracer methods to show that dissimilatory nitrate reduction to ammonium (DNRA) is an important nitrogen retention pathway in a range of ecosystems including tropical forests in Puerto Rico and Costa Rica and a boreal forest in Alaska. We have also investigated the effect of species composition on soil nitrogen cycling in a salt marsh located in the Point Reyes National Seashore in northern California. Feammox | We recently detected iron reduction coupled to anaerobic ammonium oxidation (termed Feammox), which can produce both nitrite and dinitrogen (N2). This novel process presents a new nitrogen loss pathway that can bypass the production of nitrous oxide (N2O). It also challenges the role of ammonium as a form of nitrogen that is retained in soils under anaerobic conditions. We are currently exploring the relative importance of the two Feammox pathways, t he controls on Feammox rates, and the importance of Feammox relative to other soil nitrogen cycling pathways. This research utilizes soils rich in poorly crystalline iron, from humid tropical forests in Puerto Rico and a drained peatland in northern California. Isotope pool dilution methods | The emission of dinitrogen (N2) gas from the soil to the atmosphere is a major ecosystem nitrogen loss pathway yet it is not well quantified. The high background N2 concentration in the atmosphere makes it difficult to detect soil N2 emissions. We are developing multiple techniques to measure N2 emissions from upland soils. 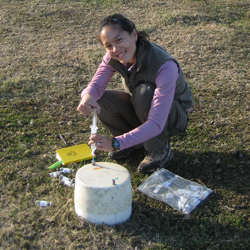 These techniques have allowed us to characterize the ratio of N2 to N2O emissions in a peatland pasture in the Sacramento-San Joaquin Bay Delta in northern California. We are now studying the controls on this ratio and rates of denitrification, the soil microbial process largely responsible for the N2 and N2O emissions.